The husband-to-be of the 16-plus size bride, whose pre-wedding photos have gone viral on social media, says he is proud of the enormous size of his wife-to-be. 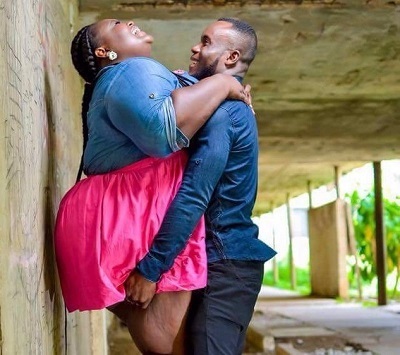 Pre-wedding photos of the now popular couple have sparked massive debate on whether size matters in relationships in several circles attracting criticisms and praise in equal proportions. While some are commending Kojo Amoah for his courage in demonstrating true love, others say the size of his choice of wife is awkward. Speaking to Starr News’ Kwaku Obeng Adjei in an interview, the Brong Ahafo-based groom said he could not have made a better choice of a bride. He, however, added that he and his bride are amazed at the public reaction to their pictures. "I normally post pictures of me and my girlfriend all the time and I wasn’t expecting this at all. I just posted it, we did a photo shoot and I thought it was nice so I posted it. “To me, I have always been a fan of plus size women and I am so proud of my woman and I don’t care about what anybody says out there. "In every society there are people who will try to discourage you from things that you seek to do but I am not bothered at all. And I don’t regret posting those pictures on Facebook,” he noted.